Well here we are well into February, where has the time gone? Daily life here this time of year isn't that exciting, unless you call trying to skate across a very frozen yard exciting! Into quite a routine now with all the feeding, mucking out, rugs off and on etc etc. 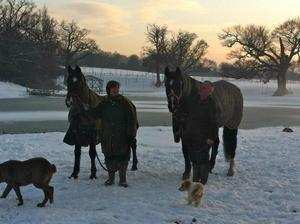 The snow hasn't bothered the horses at all in fact I think they quite enjoy it. Much better than constant rain anyway. We now have two new liveries, so a big welcome to Pablo and Mia, both settled in really well. Mia is now best friends with Ben, Pablo has joined Dublin and Rolo. Have had some other enquiries and should be another two joining the happy band in the not too distant future. Our latest foal Lottie has been purchased by Barry, who bought Lulu from us last year, so once Lottie reaches weaning age in April/May time she will be off to join them. By which time we should, all being well, have had some other new arrivals. We had some of the mares scanned and am pleased to say that two of the mares who didn't foal last year are expecting. One is Mum to Sapphire and Serenity who both belong to Rachel , and the other is Mum to Charm who belongs to Jessica. Who the Dad will be is a wait and see game, I will know if they are Kings, after all these years I can tell his babies quite easily. Talking of the old boy, I'm pleased to say he appears to be very well and as awkward as ever, he is in a yard with Jessie who is Oreo and Leonardos Mum, he stands looking over the gate watching all that goes on in farmyard with great interest, and if you dare to ask him to move he just stands there and he takes some pushing to get him out of the way, unless of course you have food with you!! April will also see the sheep lambing, so should have them skipping and jumping around as well. So, this is about as exciting as things get at the moment, a lot of work is being done regarding our other venture which is using the lake and adjoining ground as a wedding reception venue, check out 'The House Meadow at Worsenden Farm' on facebook to see what has been happening there. If anyone is thinking of getting married then we could provide the setting for a lovely reception, you could even bring your horse along. Bringing Ben and Mia in for the night.